Hi, I'm Kate. I'm 29 years old, I live on my own and I work full time as a police officer. I’ve always been a comfort eater, and with everything going wrong I went straight back to food. This has gone on for years and my weight has steadily increased until I was about 30kg away from being twice the weight I was at 18. This was a really scary thought, as although it’s still a lot of weight to put on, I could see it spiralling and the numbers on the scales just steadily creeping up forever. I knew I needed to change but just didn't know where to start. I have tried numerous ‘dieting’ plans before and it is such a cliché to say, but this is the one that has worked for me. The combination of personal feedback and constant support, along with the daily articles, are what I have personally found so useful. There is no question you cannot ask Lorna, however weird and wonderful! The daily articles mean that you are given information in small doses and you can actually take It in, rather than being bombarded or overwhelmed with a pack at the beginning. Drastic life changes are very difficult – and as humans we are usually quite resistant to change! – and almost impossible to maintain long term, whereas this teaches you in increments, slowly but surely. My favourite thing about this program is that it is positive. Far too many “diet”/fitness/nutrition programs now essentially tap into your insecurities and are fundamentally based on a criticism: “You’re too fat” / “you’re not attractive” / “you can look like this girl in the poster, because clearly you’re not good enough as you are!”. This has an entirely different approach. It is about being happy and healthy and fit. This has a much better – and psychologically healthier – approach of accepting that you’re human (fabulous, in fact) but there is room to make a couple of tweaks and be a little bit more fabulous! So what did I achieve during the programme? 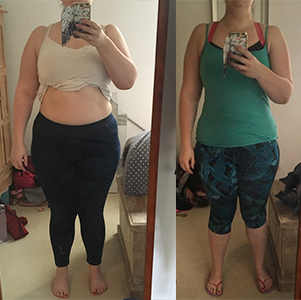 I lost almost exactly a stone going from just over 16 stone to just over 15 stone. Best of all I've lost 12cm from around my tummy so I have gone down 2 dress sizes! My fitness levels are better than they've been in a long time. At the start of the programme I ran 1500m (so just short of a mile) in 10 minutes and 48 seconds. By the end I ran it in 8 minutes and 57 seconds! One of my goals was to wear a bikini on my 30th birthday in the Dominican Republic. And guess what, I am! Best of all I know this 8 weeks is just a start. I am going to keep going...watch this space! I love that it is iPhone friendly / compatible. It's just like having a personal trainer (Lorna!) in your pocket! You take her everywhere you go! The programme isn't too prescriptive, which has multiple resultant benefits! a) Means it is realistically doable in every day life, b.) Means it is suitable for long term use, as opposed to programmes which are based on a 14 day/short term blitz which you cannot sustain for longer periods of time. Great articles and quotes accompany each day. Really good for helping you understand why you’re doing what you’re doing. 2nd point about the articles: being daily means that they are in manageable amounts and in chunks which you can actually absorb, rather than an overload of information at the beginning. Constant support and feedback. Other programs will offer you tailored meal plans but they will NOT also offer you tailored / dedicated / one-to-one support and feedback on your own personal food intake. The level of feedback is a really major selling point here I think, I’ve never heard of any other program which offers that level. I love the positivity. It isn't about comparing yourself to unrealistic images...it is about being yourself and just becoming a little more fabulous. I haven’t necessarily done the right exercises before this, so I have been running for years, but certainly didn’t do burpees and star jumps and bicycle obliques until I did this programme, so haven’t been working all of my muscle groups and getting a proper all round workout. Get yourself some workout kit and make a playlist! Buy fun colours and comfy clothes, think about throwing yourself around on the floor and whether the clothes will stay on and you won’t feel too self conscious. Bright colours cheer me up, and music is an incredible motivator. Put your gym stuff on AS SOON AS YOU GET HOME. Then you can sit down and have a cup of tea if you need to, but once you’ve got the kit on it’s really hard to make excuses... nobody sits and eats Dominos with their finest lycra on do they...?! Plus, I've learned the absolute truth of two things Lorna's said. 1) Your mind gives up long before your body does and you're capable of SO much more than you think. 2) most people have no idea what they are physically capable of and how good their body is designed to feel. Do this programme and find out how amazing you can feel! Were you inspired by Kate's story? If so why not start your own journey?